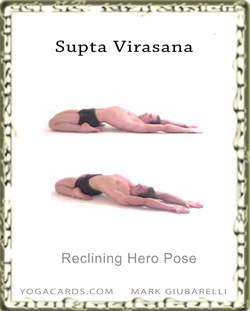 There are 2 versions of the yoga position shown below. They can be done in combination. One shows the hands in prayer position the other with the hands over the top of the head. The positioning of the hands can be varied in many postures to give a different theme or effect. Interlocking the hands and fingers over the top of the head with the palm facing away from the body can stretch the fingers wrists and shoulders. Be open to variation. It is a lot easier to get the lower back to the mat if the knees are open. You may want to open them for this reason. Both variations are shown below. The quadriceps (rectus femoris, vastus lateralis, Vastus medialis and the vastus intermedius) are stretched. Many of the smaller muscles, tendons and ligaments in the knee are also stretched. This is one of the deepest knee stretches when the knee is in flexion. Many people suffer from some kind of knee ailment due to wear and tear or injury. It is wise to protect these people from further injury or aggravation. Put safety before the necessity of getting students into a pose.